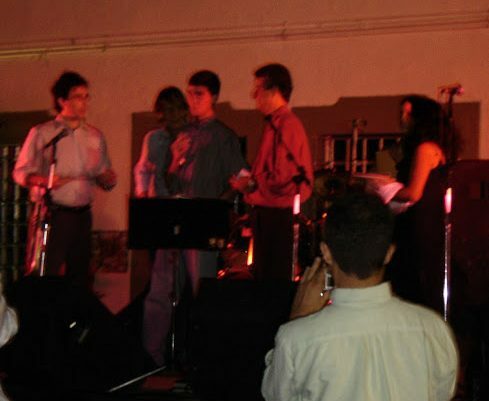 In 2004, the undergraduate research work of the student Flavio Torres da Fonseca, guided by Professor Roque Pitangueira, was chosen the best work of the “Programa Institucional de Bolsas de Iniciação Científica” (PIBIC / CNPq) in the great area of Exact Sciences, Earth Sciences and Engineering of UFMG and nominated to compete for the Highlight of the Year Award in Scientific Initiation, given by CNPq. Prof. Roque and student Flavio Fonseca receiving the best “Programa Institucional de Bolsas de Iniciação Científica” (PIBIC/CNPq) work award in the great area of Exact Sciences, Earth Sciences and Engeneering of UFMG at the Reitoria auditorium 19/10/2004). 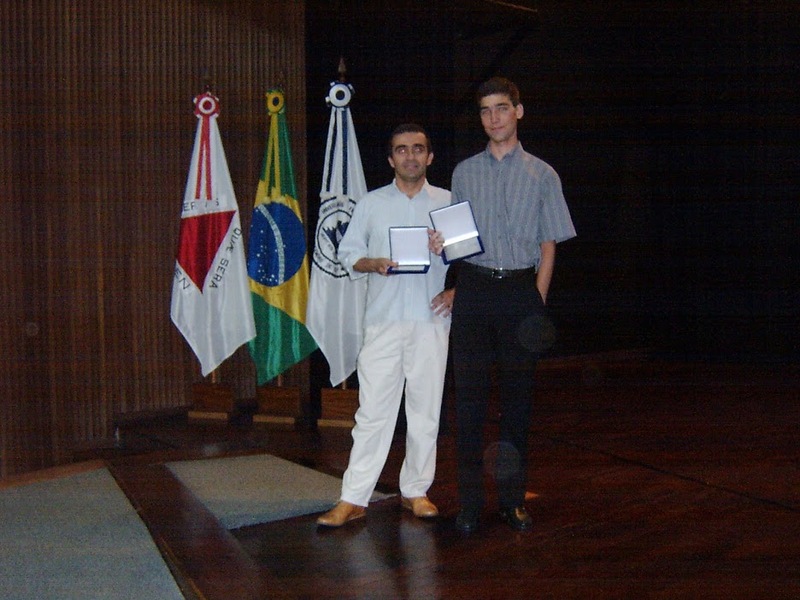 At the XV CILAMCE (Iberian Latin American Congress on Computational Methods in Engineering), held in Recife in 2004, the undergraduate research work of the student Flavio Torres da Fonseca, guided by Professor Roque Pitangueira, was third place in the prize Research Beginners on Computational Mechanics. Student Flavio Fonseca receiving the third place prize at XV CILAMCE Research Beginners on Computational Mechanics (11/11/2004). In 2009,the undergraduate research work of the students Débora Coelho Cordeiro and Carlos Henrique Belém Vilela, guided by Professor Roque Pitangueira, receveived 6th place in the Academic Relevance Award during the “XVIII Semana de Iniciação Científica” of UFMG. The doctoral dissertation of Samuel Silva Penna, guided by Prof. Roque Pitangueira, was nominated best doctoral dissertation of the Graduation Program in Structural Engineering of UFMG in the year of 2011. In 2015, the master research of Leandro Lopes da Silva, named “Interactive graphical system for the analysis of nucleation and crack propagation”, was chosen to represent the Graduate Program in Structural Engineering (PROPEEs) at the “XXIV Semana do Conhecimento” of UFMG. In 2015, Lapo Gori received the best oral presentation award at the ICMAE (International Conference on Mechanical and Aerospace), which was held in Rome, Italy. 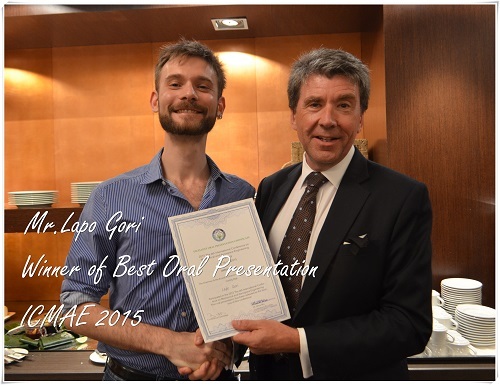 Lapo Gori receiving the best oral presentation award at ICMAE 2015. In 2016, the undergraduate research work of the students Felipe Guimarães Nunes e Marcella Passos Andrade, guided by Prof. Samuel Penna, received the Academic Relevance mention during the “XVIII Semana de Iniciação Científica” of UFMG. The doctoral dissertation of Rodrigo Guerra Peixoto, guided by Prof. Gabriel Ribeiro, was appointed as the best doctoral dissertation of the Graduate Program in Structural Engineering (PROPEEs) in the year 2016.